Measure out the ingredients. Place the eggs in the stand mixer and whip for two minutes until they become frothy then slowly start adding the granulated sugar. Continue whipping the eggs until they come to the ribbon stage, about five minutes more. 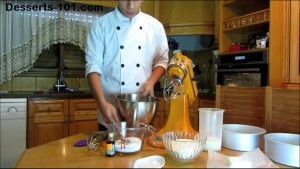 Best Vanilla Sponge Cake ingredients. Place the eggs in the stand mixer bowl and whisk with the wore whisk attachment until they become frothy, about two minutes. At this point, slowly add in the granulated sugar. Whisk until the eggs comes to the ribbon stage. The batter running off the whisk blends right in with the other batter meaning we are not there yet, whisk for another 30 seconds ti a minute and check again. 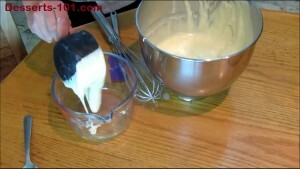 The batter dripping off the whisk for remains visible at least two seconds before it blends back in. In a separate bowl, mix the flour, salt and baking powder. 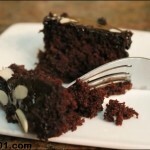 Use a whisk to aerate it. Add the vanilla extract to the eggs and whip that in. Next add the flour mixture in and whip until incorporated. 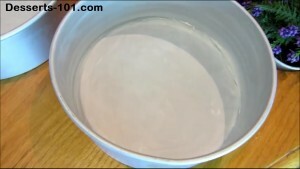 Mix the flour, salt and baking powder together in a bowl. Alternatively you can sift them together. Don’t forget to add the vanilla extract ;like I almost did. Add the flour mixture all at once to the eggs. Add the butter to the milk and heat until the butter is melted and the milk is warm. Meanwhile, place about 1 cup of the cake batter in a separate mixing bowl. Place the butter in the milk and heat until the butter is melted and the milk is warm. Mix the flour into the egg mixture. Take 1 cup of the batter and place in a mixing bowl. Once the butter and milk have been melted, add about half to the cup of batter and mix in. Add the remaining milk mixture and whisk until well combined. Pour this mixture into the remaining cake batter and mix well. Add some of the milk mixture and nix. Continue adding the milk mixture until it is add incorporated in the bowl. Now add the milk mixture into the cake batter and mix. Divide the batter between two prepared pans and bake in a 350ºF/177ºC oven until a tooth pick inserted in comes out clean. Cool 10minutes before removing from the pans and finish cooling completely. Prepared pans with pan grease and lined with parchment. Divide batter between pans and bake. 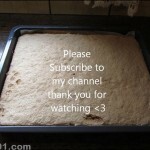 A you thought it could not be done, a new improved vanilla sponge cake recipe. Enjoy! The ingredients remain the same but I have updated the mixing method to make it a little easier. 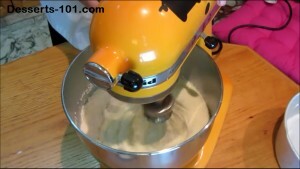 Place the eggs in the stand mixer bowl and start whisking on medium until they start to become frothy. About two minutes. Mean while, combine the flour, baking powder and salt and whisk by hand. Set aside. When the eggs become frothy, slowly start adding the sugar. Do not add it all at once or you can deflate the eggs. Continue to beat until the eggs come to the ribbon stage. To check to see if you are at the ribbon stage, lift the whisk from the egg mixture and make a figure 8. It should take about 2 second before the figure 8 disappears back into the egg mixture (about the time it takes to make the figure 8). Once you have reached this stage, add the vanilla and give quick whisk. Place the milk and butter in a microwave safe bowl and microwave until the butter is melted and the milk is slightly warm. Add the flour all at once to the egg mixture and whisk until combined. Place 1 cup of the batter in a mixing bowl. Once the milk mixture is heated and the butter melted, add half of this to the cup of batter and mix well. Add the remaining milk to the batter and mix well. 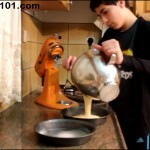 Pour the milk mixture into the batter and mix well. Divide the batter between 2 prepared 8-inch (20cm) baking pans. 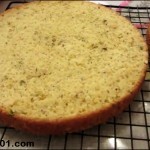 Bake in a preheated 350ºF/177ºC oven for 20-28 minutes or until done. Allow to cool 10 to 15 minutes in the pan before turning out onto cooling racks to cool.